Male privilege is the belief that men are entitled to certain privileges that women are not, simply because they are men. Male privilege is not a theory or an opinion. It is a reality upon which our present social system is based. It is a system based on a scarcity mentality: the power pie is only so big; the more power women have, the less for men. According to the abundance mentality, there is enough to go around if it is shared equitably. Male privilege is not granted by nature, some divine being, or hormonal differences. It is a belief system of power and control established by men, enacted by men, and enforced by men. It is woven into the very fabric of our culture and imprinted into the way we see and think. It is a system that men and women are born into and perpetuate (isn’t this just the way things are supposed to be? – men provide and protect; women love and obey). Since men benefit directly from it, they often say, “Why question it or change it?” Those women who benefit from it indirectly through their partner’s power and status may ask, “Why all the fuss?” Any answers or suggestions? It is a system rooted deep within the history of mankind which has served to oppress and enslave women. Question: Why “mankind” rather than “people kind?” Point being that language is how culture (our beliefs, thoughts and behavior patterns, institutions, etc.) is transmitted from one person to another and one generation to the next. This provides a good example of how pervasive and deeply ingrained male privilege is and how it is perpetuated. Other examples: “All men are created equal” … why not “all people are created equal?’ What other examples of language reflect male privilege? How is male privilege used as a form of control? Men traditionally have dominated the family, politics, law, finance, education, the police, the military, and more. They have the power to gain and maintain control. How does male privilege support domestic violence? It fosters the belief that women are weak, dependent, and not capable of making life choices for themselves and that men have the authority to make those decisions for them. 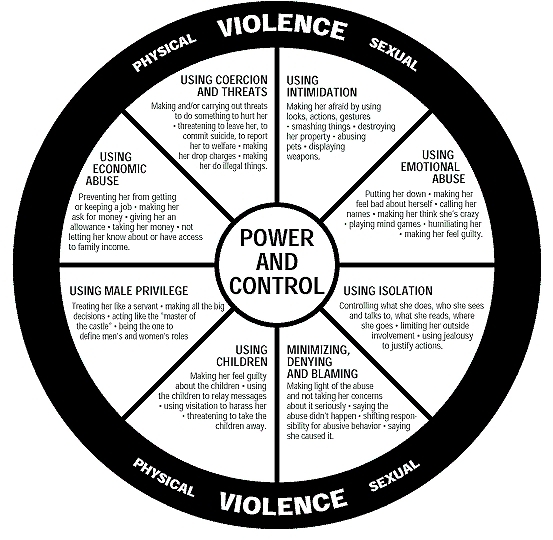 When this authority is challenged, abusive men react by using controlling and abusive behaviors, including violence, in order to maintain control and retain the privileges they believe they are entitled to. If men view male privilege as a given, why do they abuse it? They feel threatened. It is a system based on a scarcity mentality, outlined above. Again, with the abundance mentality, there is enough pie (power) for everyone if it is shared equitably. Perhaps some men fear that women who gain power will start acting like men and start abusing them. What do you think? What is the intent of men abusing male privilege? The intent of male privilege is to maintain control of the family or relationship structure using any means they choose. These men abuse this privilege when they seek to get something (or everything) out of the relationship without putting anything into it. They want to be waited on and be taken care of even though they are capable of doing it their selves. These men want to get their own way without having to negotiate and compromise even if it involves using abusive behaviors. They want to be respected even though they haven’t earned it. What is the impact of men abusing their male privilege? It devalues her worth as a human being and her abilities. It fosters an unhealthy dependence and self-doubt. It destroys self-esteem. She may feel trapped, angry, powerless, unfulfilled, resentful, and worthless. She learns to be manipulative in order to get what she wants. Same as above as well as “this is how it is in the real world.” Girls learn submission; boys learn aggression. Both learn it’s okay to be abusive, controlling, and violent. Both learn that violence is the way that a person gets what they want. The cycle continues. Healthy relationships are based on mutual caring, understanding, respect, and equality. Male privilege by its very nature destroys the qualities of a healthy relationship. By abusing their privilege, these men will never become fully functioning human beings because, emotionally, they will never grow up. They never learn what a caring, mutually respectful relationship is all about. It is a system that fosters sexism, racism, heterosexism, and discrimination. Because resources are unequally distributed, poverty becomes a way of life for many. Sexism, racism, homophobia, discrimination, and poverty are the worst forms of violence because they destroy human dignity, human potential, and human life. Male privilege creates a system that blames the victims until after a while the victims blame themselves. “They deserve it,” “She asked for it,” “That’s all they’re good for,” “She made me do it,” “You can’t trust any of them,” and so on. It is a system that creates unnecessary human suffering and it affects us all.